Hi! This looks great, but I have a question. In the description you say it calls for white cheddar cheese and the ingredient list states white American cheese. Which is it? I prefer cheddar since it’s not as processed as American, but hey, cheesy goodness is hard to beat either way. Just wondering which is correct. White cheddar cheese. Thanks for catching that! This recipe was a complete fail. Rather then a dip it was a thick curdled mess. I was so embarrassed to go to a bbq empty handed because this dip did not work out. I also think the measurements are way off. Far too much spinach and canned tomatoes. Sorry but I would not recommend this recipe. I am sorry it didn’t turn out. It works out amazing every time for me and is not curdled at all! I agree. Mine turned out to be the same as your Kayla. Really disappointed, to be honest. Was looking forward to eating it. You can’t boil half and half it will curdle. Try whole milk or heavy cream next time. I agree, I will never use this recipe again. Just like you stated a curdled mess. What a waste of time and money. Do you think it could be transferred to a slow cooker (after it’s been cooked in the skillet) to keep warm for a party? My silly small town store doesn’t have white cheddar. But they do have quest fresco. I wonder if that Would that work in place of the cheddar? Just wondering how this recipe did in the slow cooker? Also, I’m wanting to serve this at a Super Bowl party. Recommendations on doubling or tripling the recipe? Well, I made this for Super Bowl today and although it tastes very good, the consistency of the dip suffers. It’s very “grainy” tasting. Even though I added a small amount of white Velveetta, I think the use of CHEDDAR cheese is the cause of the graininess. Next time, I think I will use white American cheese, which is much easier to find in my local supermarket. I think it will make it a creamier consistency. All in all very tasty, but not the mouth feel I was expecting. I could not get the milk and cheeses to come together. The cheeses melted and stayed gooey while the milk just slushed around the side of the pan. I’m going to try and bake it to see if that will help before serving. I tried this today, it was looking great but then I added the spinach and Rotel! It turned to a watery mess with a glob of melted cheese. I was so disappointed. Great recipe, though needs flour to bind the milk and cheese so its not a cheese glob. I sprinkled some flour on the final product to fix. Delicious recipe. I love the flavors in this dip. Sadly my dip separated as well. Any ideas how to salvage this hot mess? So I made this dip for National Dip Day at my job. Oh my goodness, a watery mess!! I ended up reading the comments and saw where the lady added flour…..what a lifesaver! I took the bonded cheese portion out the skillet, added flour in the watery portion and whisked until I had a roux then I added the cheesy portion back in and eureka!! A good tasting dip! Its the spinach and tomatoes I think that water it down and no binding agent. But it does have a nice spicy flavor to it. Just made this for our Thanksgiving lunch and it turned out great. I will say that I only had 6 oz of the white cheddar and I used much less spinach, but it was terrific. It’s a bit runny at first, but begins to solidify more as it cools. The family enjoyed it and it was a tasty alternative to our usual salsa and chips. Hi, this looks great! I want to make it for a party and am wondering what if anything I should do differently if I want to bake it, instead of on a skillet, so it can stay warm in the oven until party time. What do you think? Thanks! Wow, this dip is amazing! I am so surprised by how many people mess up something this simple. You just combine the ingredients, how do you end up with anything curdled or watery. Mine looked exactly like the picture and tasted so good! Will definitely make this again! I am not a fan of American Cheese. 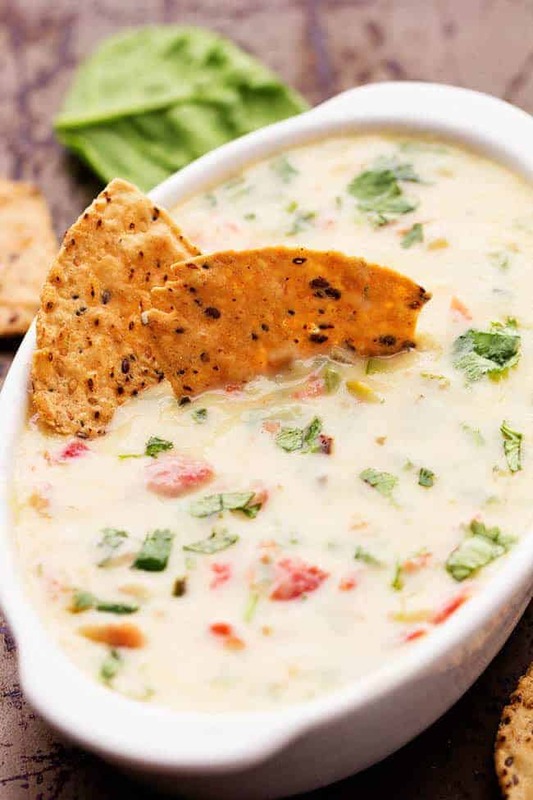 What would you recommend using in place of the White American Cheese in this recipe? I made this. I used white American because I didn’t catch the white cheddar part. It turned out well. It was a little thick, but my boyfriend’s whole family loved it. It was gone in no time. I’m shocked by the negative reviews. I’ve made this recipe 20 times easily and it comes out perfect and is always a hit! I use American cheese and drain the Rotel. I have made this two times already and each time it turned out perfect. 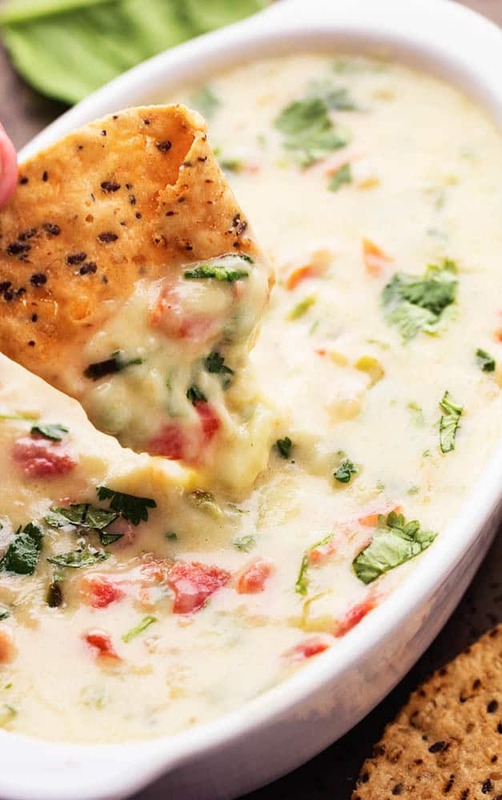 This is absolutely my new favorite dip and it’s so easy to make. I used the white American cheese instead of the cheddar. I just made this for the first time and my husband and I think it’s delicious. Great recipe, Alyssa. I came back to forward the recipe to my Sister. I am also shocked at the negative reviews. First, it’s a recipe. A guideline. If it’s too thick, reduce the amount of spinach a bit or add a bit more cream, or cheese or use a bit of the juice from the Rotel tomatoes. For those that said it was grainy or curdled, her directions say to saute at medium heat, ,and then add the cheese and stir till melted. She doesn’t say to boil it. Cheese will separate and curdle if you apply too much heat. Once I had everything melted I transferred it to a small crock-pot to keep warm and it’s perfect. Love a dip that uses REAL cheese, not processed cheese food product.